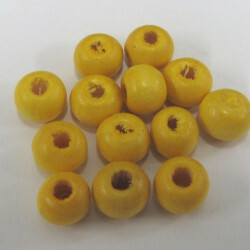 Yellow wooden beads There is 1 product. WB2340 - Yellow wooden beads, pack of approx 100﻿. These are almost round, about 7.5mm at widest and 6mm at narrowest. A good bright yellow.